All set. It now works with all web browsers. 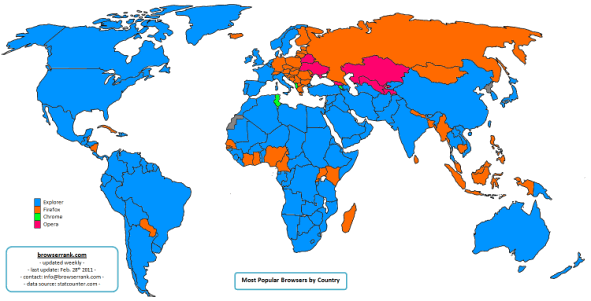 BrowserRank has put up a world map which displays the most popular web browsers in various countries, both desktop and mobile. It’s the 1st of March already, so let’s dive into February market share data. With the release of Internet Explorer 9 RC, Microsoft has taken some share back, up from 56.00% to 56.77% (0.77 point increase). While everyone awaits the final version of Firefox 4, an open source web browser continues the downtrend, from 22.75% to 21.74% (1.01 point decrease). Well, it looks like the upcoming Mac OS X Lion release will feature an improved Safari web browser that finally utilizes Webkit2. One of the main framework goals is to utilize a split process model, so the web content would be placed into a separate process. As a result, bad plugin, tab etc. won’t crash the whole web browser. This behavior is very similar to Chrome’s; however, as split process module is directly integrated into WebKit2 framework, other clients will be able to use it as well. Don’t forget that you can receive points for asking/answering questions and redeem them for cool prizes. Load previous site in new tab? Downloading Opera Turbo fails, any direct link? Is there any way to download Opera Voice separately? Good news, the team behind Web Inspector has pushed a new version that improves CSS editing capabilities. The Web Inspector will now show all the declared properties, even the ones that are not understood by a web browser. Color property values can now be shown exactly as they written in an inline style. It now uses two separate fields for property name and value. And best of them all: the history of style sheet. This means that you can now track all the CSS changes that were made during editing. Overall, it’s a nice update and we hope to see CSS tracking implemented into other dev tools as well. Web-browser battle: which are you using and why? Suggest some skin/theme for firefox, opera, chrome? Why does Opera fail to grab a good per cent of user base like IE/Firefox/Chrome? What was the first browser you ever used? Help to Disable Panel While Checking Feeds? Why Does Firefox Copy Opera? As discovered by BrowserCheck (which scans Windows, Mac and Linux machines for vulnerable browsers along with browser plug-ins), Oracle’s Java was the most probable plug-in to be outdated for the second year in a row, comprising a total of 40% scanned systems. Adobe’s Reader and Apple’s QuickTime were second and third, taking up 32% and 25% respectively. Microsoft taking charge of patching crucial third party plug-ins via single updater. Moving to HTML5, so browsers would no longer require various audio and video processing plug-ins.